Believe it or not, these treats are as easy to make as they are pretty. While they appear complex, the recipe only requires a few steps and about 30 minutes. 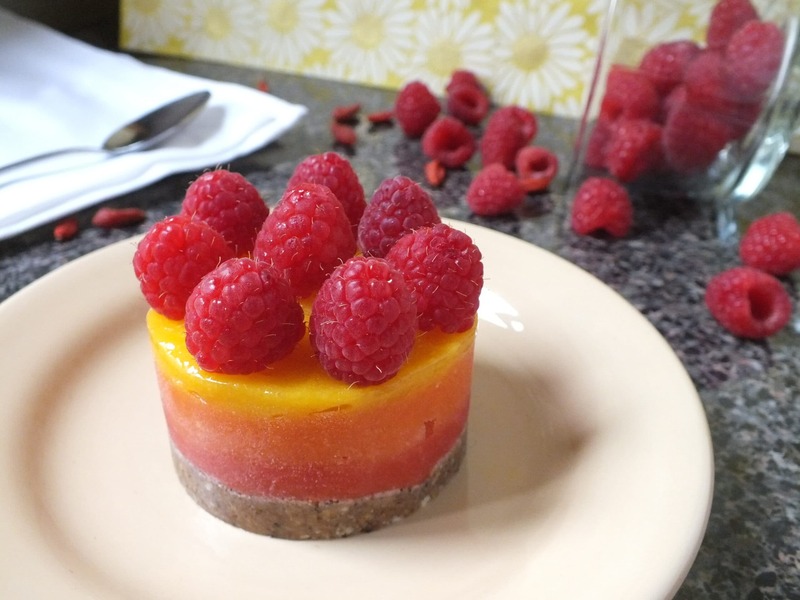 The result is a hot-summer-day-worthy dessert with no added sugar. 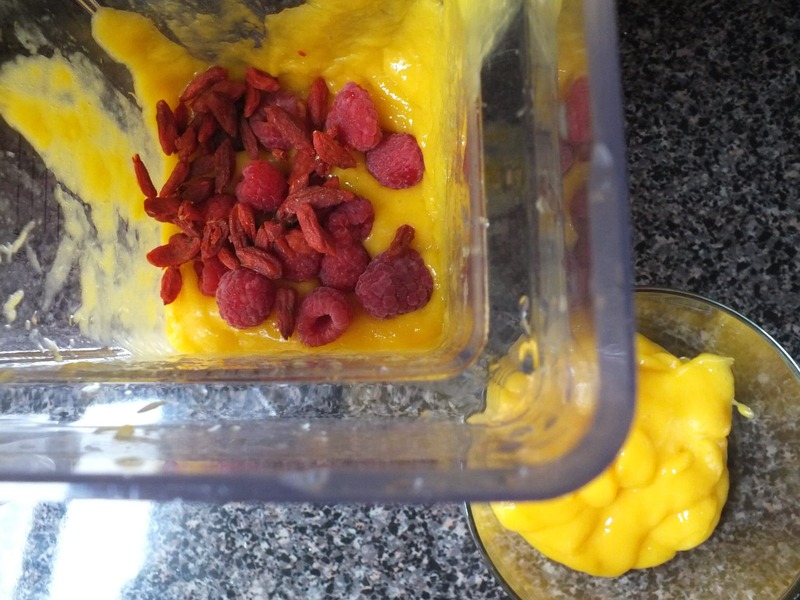 Add 1/4 cup goji berries and 1/2 cup raspberries to the blender and blend. Pour half of that mixture into another bowl. Then add remaining raspberries and goji berries to what is left in the blender for the 3rd puree. 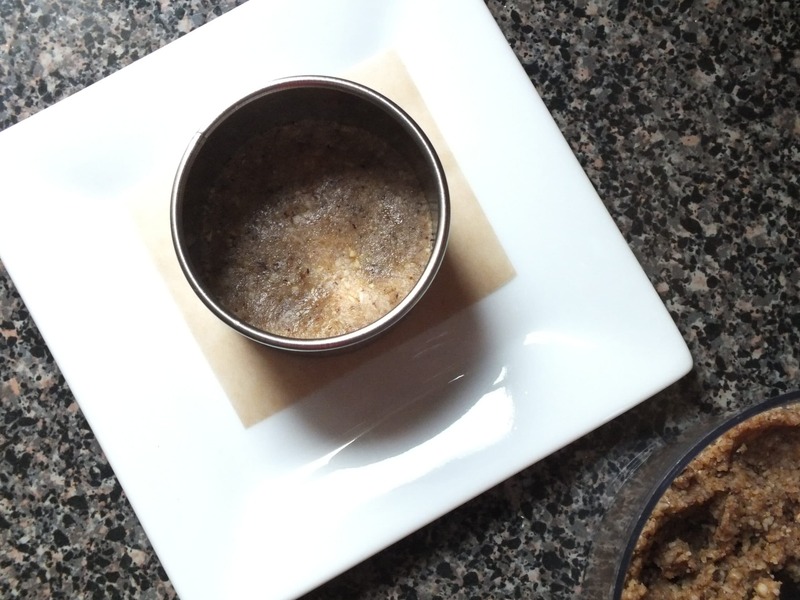 Add walnuts, raw honey, shredded coconut, ginger powder, and cinnamon to the food processor. Pulse and process until the mixture looks like a crumbly dough. You should be able to shape it with your hands. 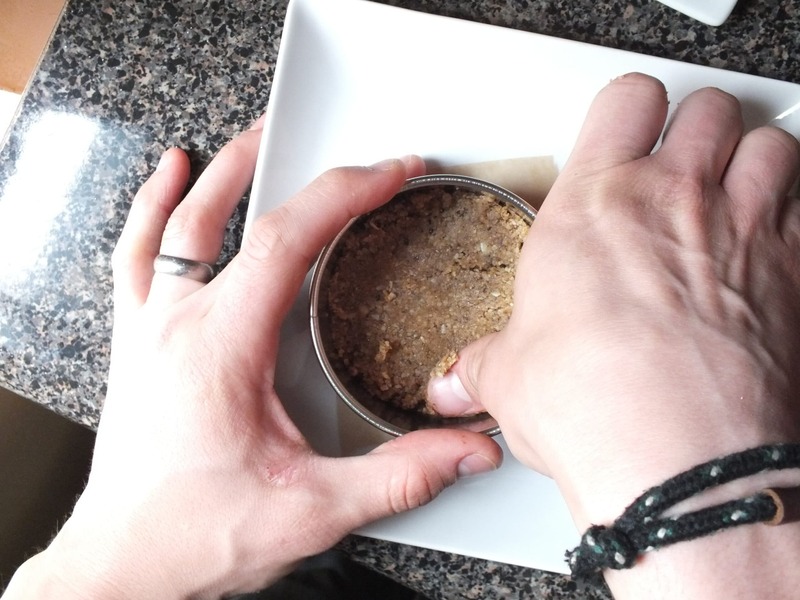 Cut a square of parchment, wax, or foil slightly larger than the size of the cylinder – one for each tart. Use your finger to lightly coat the inside of each tart form with coconut oil. Place the cylinder on top of the paper squares on a plate. Spoon dough into each and use your fingers to press it down into a crust layer – about 1/4 thick. Next, spoon the reddest puree over the crust and smooth it out. This layer should be about 1/2″ thick. Next up is the orange-y layer. 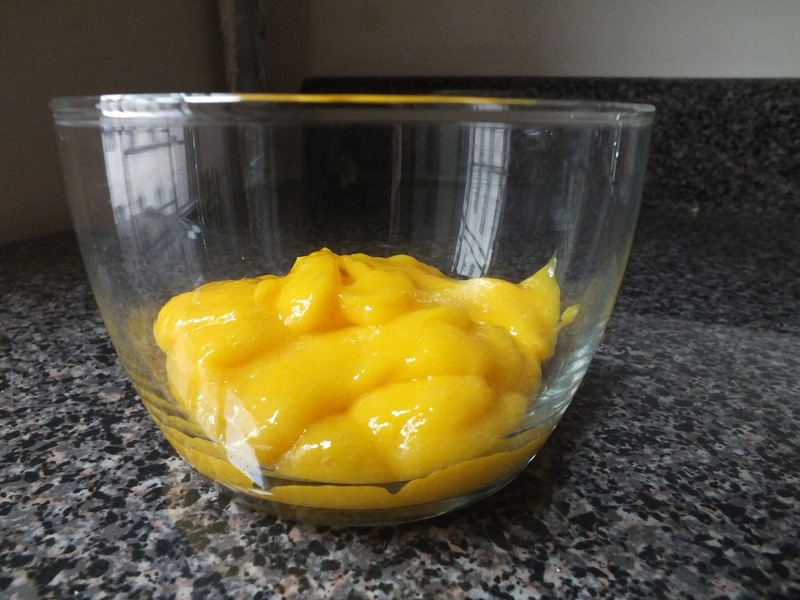 Gently spoon a portion on top of the red layer and use the back of your spoon to spread it. 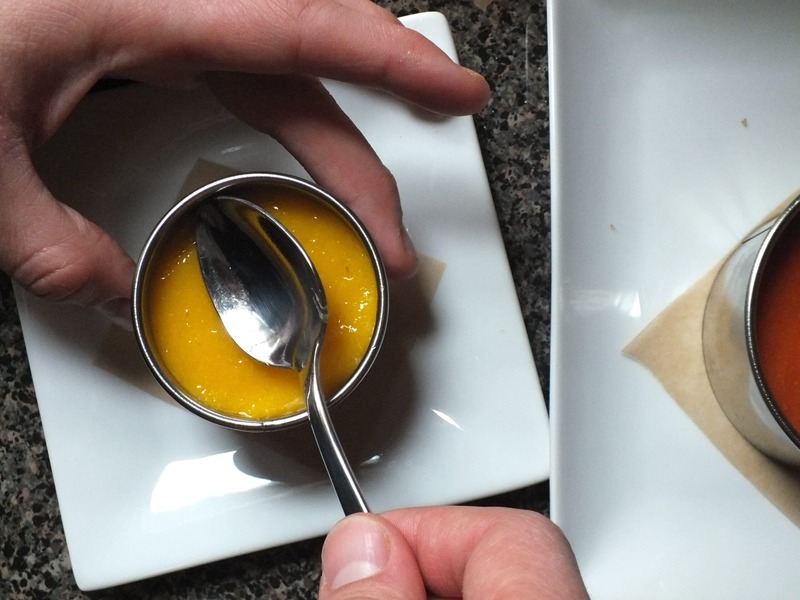 Repeat with the mango puree. 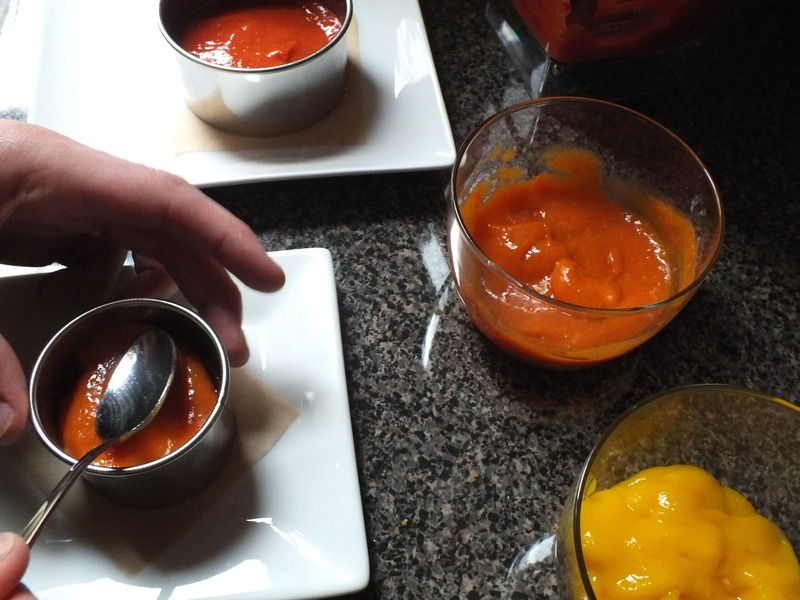 As you are smoothing out each layer of puree, be careful not to push down too hard. Doing so will mix the layers together and you won’t get the “3 layer” look. Once all that layering is done, place the plate with tarts into the freezer and chill for at least 3 hours. 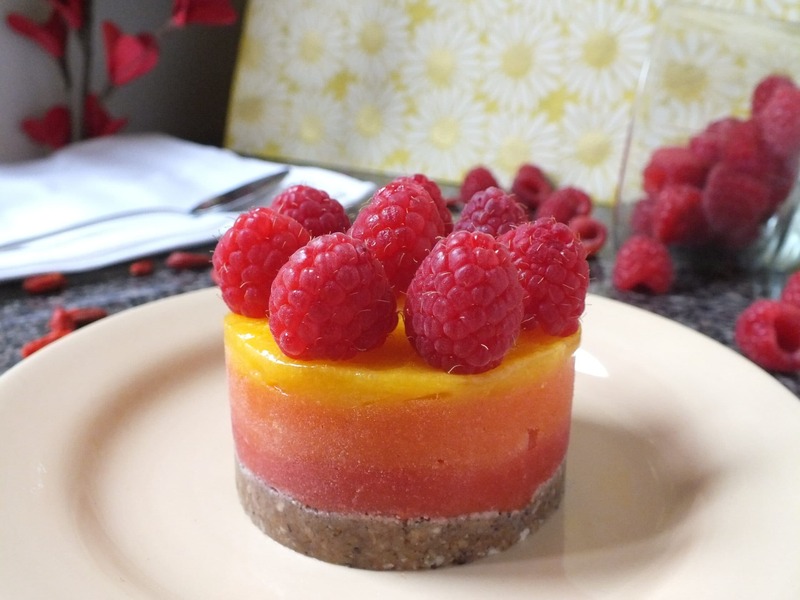 When they’re frozen, remove them from the freezer, and slowly push the tarts out of the forms. Ours came out without a fight, but if yours are being stubborn, wrap your hands around the cylinder to warm it, then try to remove the tarts again. We topped our tarts with raspberries and allowed them to thaw in the refrigerator for about 30 minutes before eating them. They’re best eaten with a fork and slowly – to avoid the dreaded brain freeze. 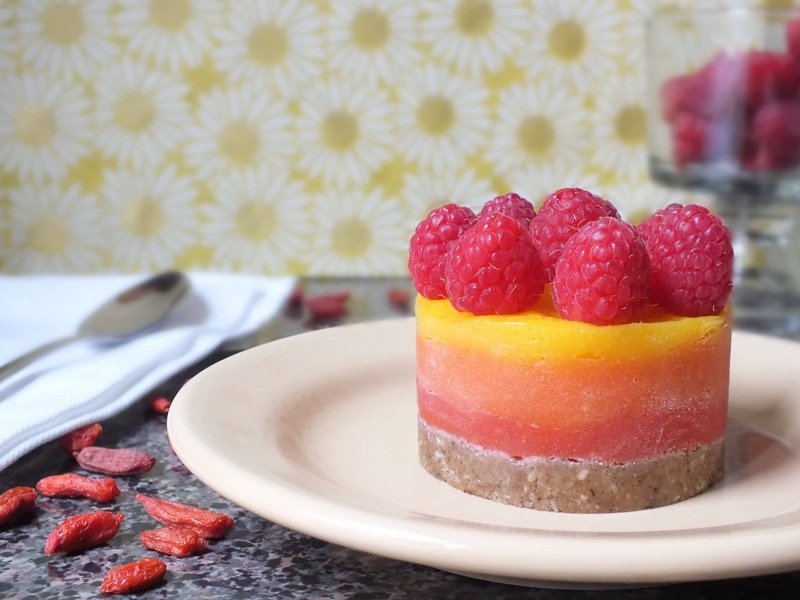 The Global Girl gave us the inspiration to try a 3-layer dessert. After seeing how easy these are, we’re already scheming future flavor possibilities. This recipe looks delicious, however I’m allergic to walnuts so can you supplement those with something else? Hi Alex! You could certainly try substituting almonds or cashews for walnuts. Either option should work! Any ideas for the crust if the recipient has nut allergies?? It’s her birthday on Friday, and I’m sure she’d love these!! Thanks!! 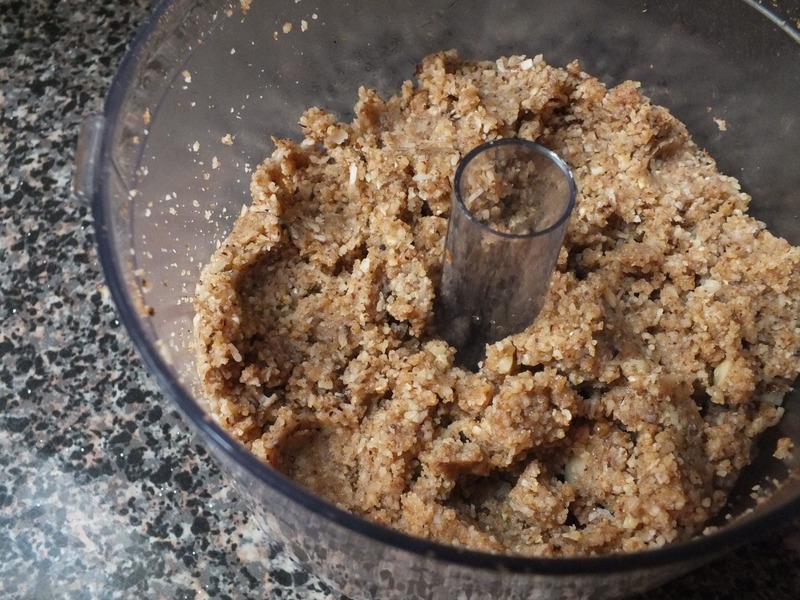 You could try to sub in a mixture of oats and oat flour instead of nuts. You could also try crushed graham crackers. We’ve only tried this with nuts, but I’m sure either of those options would work! How many tarts does this recipe make? I checked the referenced website and it is not mentioned there either. Thanks. It makes 4 – 2 inch tarts. :) Thanks for the question, I’ll make that more clear in the post! This looks amazing!! Unfortunately I’m deathly allergic to nuts… What could I use as a substitute for the walnuts in the crust?? this recipe looks yummy! cant wait to try it. i dont have any “tart forms” what else can i use to make individual ones? You could try to use a muffin pan with saran wrap or a paper muffin cup. It might be a little tricky but it could work! i googled tart forms and couldnt find any that looked like the ones you used…are they just big cookie cutters? were did you get yours? This looks great. 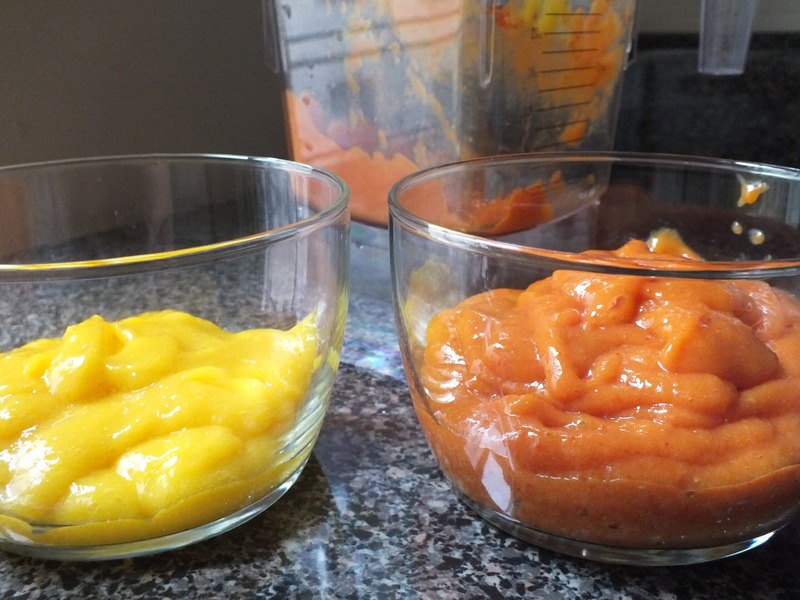 How much of the berries do you put in the mango purée the first time (for the orange middle). And how much coconut oil do you put in the crust? I see the shredded coconut but the oil is not listed. Thanks! Sorry, that step was a bit vague! Add 1/2 cup of raspberries and 1/4 cup of goji berries. And instead of coconut oil, that step should say shredded coconut. No oil goes in the crust besides a bit around the tart form to help the dessert slide out after freezing. Fixed our mistakes – thanks for asking! I made these the other day using thawed pulsed frozen dark cherries and they were great! I would suggest using vanilla extract on the crust. Also topping with soy yogurt makes them super tasty. Cherries sound like a delicious idea! Thanks for the suggestion. We’re glad you liked it!! these are so beautiful!! my mom and I want to make these for no reason at all- just as a pretty treat for ourselves. Spontaneous mother-daughter dates are always a good thing! Sometimes a pretty treat is all you need. :) Enjoy! This looks amazing! I am going to try it asap! Thanks for the awesome recipe. It tastes just as beautiful! These tarts looks so pretty and sound so delicious. I never would have throught to puree dried goji berries. You never know until you try, right?! Just as delicious as they look!